Coconutmagic Raw Organic Virgin Coconut Oil is directly extracted from fully harvested coconuts to provide the best organic coconut oil that have versatile uses in your daily beauty regime and even in the kitchen! Coconutmagic Coconut Oil goes through a wet method centrifuge extraction process which involves cold-pressing all the coconut oil and leaving it as is, with absolutely no heat or chemicals added during the the production process. 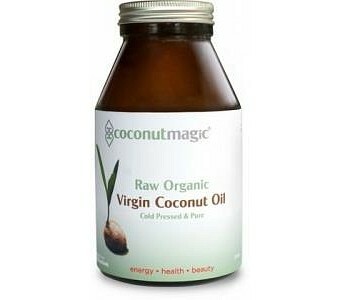 This ensures that Coconutmagic?s Coconut Oil stays pure in its form and solidifies all nutritional content. In its 500 ml size jar, you can easily store these large-size jars of Coconutmagic Coconut Oil in your kitchen pantry and use Coconutmagic as a cooking oil to replace fatty and unsaturated oils such as vegetable and canola oil. You can even replace butter with Coconutmagic Coconut Oil and spread it on toast. As part of your beauty regimen, Coconutmagic Coconut Oil is a great hair conditioner that will leave your hair feeling soft and manageable. As you can see, Coconutmagic Coconut Oil has many useful benefits that you?ll simply love. Gluten free No GMO?s Vegan friendly 500 ml large-size jars can be conveniently stored in kitchen cupboards and pantries for long-term use Ingredients: 100% certified organic, cold-pressed, raw virgin coconut oil.